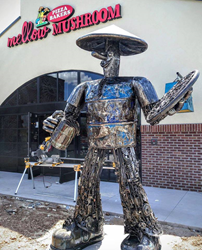 Handcrafted pizza and a unique and eclectic, art filled environment are just a couple of reasons to stop into Mellow Mushroom Mesa today. The Phoenix area needed the best pizza around, and why not expand Mellow to the SE Valley. Mellow Mushroom pizza is unique and delicious to what our area has and I think it will be a great experience for everyone to enjoy. Mellow Mushroom Pizza Bakers is now open in Mesa, Ariz., at 1665 South Stapley Drive. This Mellow sports a clean, sleek and contemporary yet warm and inviting design, full of intriguing one of a kind artwork, inviting guests to explore the interior and seek out conversation pieces. All Mellow Mushrooms are known as places that provide an entertaining experience in a unique, artistically decorated environment, and this one is no exception. Art work to be seen in the store includes hand painted murals inside and out as well as unique customized art pieces, including the highlight of the dining room, a giant colorful owl adorned with peacock feathers spanning over 25 feet in length. The vibrant colors create an eclectic backdrop to a wide open dining area featuring custom light fixtures from around the world. The majority of artwork in this newest Mellow, were created by Dreamscape Design and Fabrication from Atlanta, GA. Two of the most unique pieces in the store include a large original painting by Greg Lanterman called “Hungry Eyes” along with a beautifully handcrafted abstract sculpture made entirely of brass bullet casings by Indonesian artist Timbul Raharjo. Activities abound. Catch all sorts of sports action on any of the TVs with direct TV. Having a business meeting or need a great lunch spot, check out there Monday thru Friday lunch specials starting at $4.99 from 10:30 a.m. to 3:00 p.m. This location will also have Happy Hour featuring: half price appetizers and select alcoholic beverages from 3:00 p.m. to 6:00 p.m. and Reverse Happy Hour from 10 p.m. until 2:00 a.m. There is also a semi-private area that can accommodate up to 20 guests. The floorplan is also set up for with plenty of booth seating and an open dining area with tables.